If you have a large yard with lots of trees nearby, you may dread autumn for the falling leaves. Everyone wants a clean, clear lawn, but everyone also wants the process to be as easy and efficient as possible. If you invest a lot of time and effort into lawn care, you may want to buy a backpack leaf blower. The Husqvarna 350BT is one of the best mid-sized leaf blowers for professional landscapers and for people with large yards. It weighs 22.5 pounds and has a ventilated harness and hip belt to prevent strain on your back. All Husqvarna leaf blowers use a 50 to 1 ratio for gas to oil, which is 2.6 ounces of oil for every gallon of gas. The 350BT fuel tank holds about a third of a gallon. Husqvarna sells oil and pre-mixed fuel, but any brand of oil and fuel should work just as well. The 350BT has an X-Torq engine that releases less harmful exhaust and has better fuel efficiency than the average engine. You can save money on fuel while also protecting the environment. Many reviewers praise the leaf blower’s comfortable fit, too. You should be able to use it for a long time without running out of fuel and without feeling pain or strain. The leaf blower has a cruise control function that will keep a constant fan speed, so you don’t have to regulate the fan while you work. It can reach wind speeds up to 180 miles per hour, which is more than enough to move leaves and even small rocks. The air purge feature removes extra oxygen from the carburetor, which makes the leaf blower easier to start. However, some reviewers say that it always takes at least three or four pulls to get the leaf blower started. Another common complaint is that the tube, which is in two separate sections, attaches very loosely and sometimes becomes detached. It’s easy to put the tube back together, but it can be inconvenient. A few reviewers also mention that the 350BT isn’t the best leaf blower for tough-to-reach areas because of its large size. It’s much better for wide open areas. 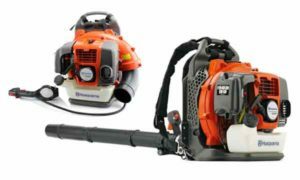 The Husqvarna 350BT is one of the most popular and most highly reviewed leaf blowers on the market. It’s recommended for professionals as well as amateurs. Besides a few minor issues, it should be a great tool for keeping your yard clean and clear. 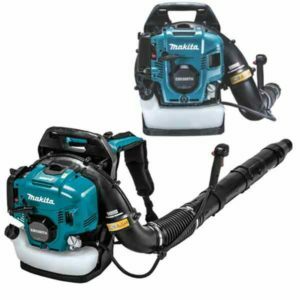 The Makita MM4 is one of the easiest backpack leaf blowers to use. Unlike most leaf blowers, you don’t need to mix oil in with the gas in the tank. It only requires gas, so you don’t have to spend extra time and money buying and mixing the fuel. The pack weighs just under 20 pounds, and it has padded straps and a padded back panel for comfort. It also has anti-vibration mounts that stop you from feeling the vibrations and allow you to use the leaf blower for a long time without getting uncomfortable. This leaf blower has a clean-burning engine, and its maximum airspeed is 184 miles per hour. This should be plenty of force to take care of your lawn or garden. The tank holds about half a gallon of gas. The MM4 has a muffler for quiet operation, so it usually only reaches about 70 decibels. This is loud enough that it might be irritating after a long time of use, but it won’t actually damage your hearing. Most leaf blowers operate at about 100 decibels, which can cause damage after prolonged use without hearing protection. The Makita MM4 mostly has excellent user reviews. However, several users point out issues with the backpack straps. If you have a smaller frame, the shoulder straps might slip off occasionally. One reviewer says that the backpack is awkward to wear and would be much better with a chest strap. Overall, the MM4 is a great leaf blower. As long as you’re okay with a few minor issues with the backpack straps, you should find it effective, comfortable, and easy to use. The Husqvarna 150BT is very similar to the 350BT, but the main difference is the tube size. The 150BT has a tube with a smaller diameter than the 350BT, which means it has a lower volume but a stronger force. The leaf blower weighs 22.5 pounds and has a hip belt, wide shoulder straps, and a ventilated harness to prevent you from overheating or straining your back. It uses an X-Torq engine for fuel efficiency and for lower harmful emissions. When mixing the fuel for the leaf blower, you should use a 50 to 1 gas to oil ratio. The 150BT can reach an airspeed of 250 miles per hour, but you probably won’t need that much force for leaves or even for gravel. You should be careful before using the leaf blower on full speed around a gravel driveway with cars nearby. A strong leaf blower is great for lawn care, but it’s not so great when it sends rocks flying into your car. Eye protection is also a necessity with this leaf blower because it stirs up so much debris. This leaf blower seems to be fairly comfortable and easy to use. All of the backpack straps are adjustable, so it should fit you properly no matter your height or weight. Unlike the 350BT, most reviewers say that it starts up easily after just one or two pulls. The leaf blower has LowVib dampeners, so you shouldn’t be bothered by vibrations. It also has a cruise control feature that lets you keep a steady speed without constantly regulating the fan. The 150BT has comfortable backpack straps, but it’s not the lightest pack on the market. Some reviewers say it’s a little too heavy and puts strain on their back after prolonged use. If you’re not used to wearing a heavy pack, you may have to take breaks every so often to prevent strain. The backpack is also slightly bulky, so it’s hard to maneuver into tight areas. You may need a handheld leaf blower or a smaller pack for tough-to-reach areas in your yard. The Husqvarna 150BT is one of the most powerful leaf blowers on the market. Because it has a smaller tube size, it won’t cover as wide of an area as quickly as other leaf blowers. However, it’s one of the best options for clearing heavier leaves or debris in your yard. The PB-770T ECHO weighs about 24 pounds and reaches a maximum air speed of 234 miles per hour. Like the Husqvarna 150BT, you have to be careful with such a strong force. You should wear eye protection and be careful when using the leaf blower near gravel. You’ll also need ear protection, especially if you plan on using the leaf blower for prolonged amounts of time. When you buy the leaf blower, the package will come with two-stroke oil to mix with gas. To assemble the leaf blower, all you have to do is put the four-piece pipe system together. The package comes with a user manual, but you might not even need it to put the leaf blower together. The fuel tank is larger than average at a little over a half-gallon, which means you can work for longer without needing to stop and refill. This leaf blower has a vented back pad, a padded back rest, and comfortable straps. Many reviewers say that they stayed cool even when using the leaf blower in the summer heat. The pack and engine are designed to reduce vibrations. The leaf blower also has a variable speed throttle and cruise control, so you don’t have to worry about constantly adjusting the fan. One of the product’s best features is the flexible tube, which lets you maneuver in tight spots. At 24 pounds, the PB-770T is one of the heavier leaf blowers. Most users say that the pack is comfortable to wear, but it might start to feel too heavy after an hour or so. One reviewer pointed out that when you hit the switch to turn off the engine, you have to take the backpack off completely to restart it. This can be a big inconvenience whenever you accidentally hit the switch or when you turn the leaf blower off to talk to someone or to hear something. The only other drawback to this leaf blower is the price. It’s a very high-quality product, but many people are hesitant to spend so much if they’re not professional landscapers. 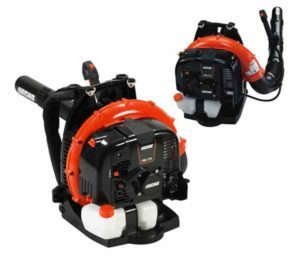 The PB-770T ECHO is one of the best leaf blowers available. It’s good for covering large areas as well as tough-to-maneuver cracks and crevices. If you’re willing to splurge on a high-quality leaf blower, this might be one of your best options. 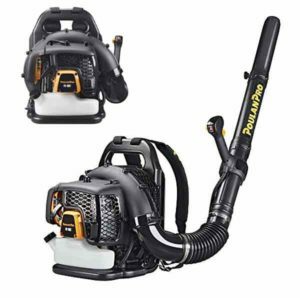 The Poulan Pro leaf blower weighs 22 pounds and uses a 50 to 1 ratio of gasoline to oil. The package comes with a bottle of oil, a spark plug wrench, and a screwdriver, which should be the only tools you’ll need to assemble the leaf blower. Some users say the leaf blower is difficult to assemble, but the user manual is included in the package and should help. The leaf blower reaches a maximum speed of 200 miles per hour and can clear wet leaves, sticks, and small pieces of gravel. The leaf blower has a cruise control feature and a variable speed throttle. Most users say that it fires up easily after only one or two pulls, and it doesn’t take much physical effort to clean the entire yard. It also has a heavy-duty frame, so it’s resistant to wear and tear and can be used in rough conditions. Some reviewers even use the Poulan Pro to clear snow from their driveways in the winter. The heavy duty frame has its benefits, but it also adds some weight to the leaf blower. Although 22 pounds isn’t the heaviest product on the market, it may not have the most comfortable design. A few reviewers say that it starts to feel too heavy after a while. You can try adjusting the back and shoulder harness to reduce the pressure, but you may have to take breaks while cleaning your yard if you’re straining your back or shoulders to carry the pack. Also, the Poulan Pro isn’t as fuel efficient as some other brands. The Poulan Pro is one of the best budget backpack leaf blowers. Because it’s less expensive than the other products on this list, it does have a few flaws. However, it performs well and has all of the important features. It comes with a two-year warranty, so you should be covered if there are any issues during this time. Most backpack leaf blowers cost several hundred dollars, so you should think hard before making a purchase. There are several types of leaf blowers, and there are important features to look for within each type. You should make your choice based on how much area you have to cover, what type of debris you need to clear, and how much weight you can carry. There are two main types of backpack leaf blowers: electric and gas. With electric leaf blowers, you don’t have to worry about filling up a fuel tank. They also are usually quieter than gas blowers. Gas leaf blowers are much more powerful, though, and they’re usually a better option if you have a large area to cover. You also should understand the different engine types. The two most common engines are two-stroke and four-stroke. A two-stroke engine is lighter and easier to maintain than a four-stroke, and it usually can deliver more power at a similar weight and size. Two-stroke engines need a mixture of gas and oil to operate properly. The product label or manual will tell you the correct ratio. It’s important to follow these instructions, or there will be serious damage to the engine. Four-stroke engines tend to be more fuel efficient than two-stroke engines, so the tank will last longer before needing refilling. An ergonomic design is one of the best features to look for in a backpack leaf blower. Who wants to spend hours outside in the heat while lugging around a heavy and uncomfortable pack? A well-designed leaf blower will evenly distribute its weight on your back and shoulders, so it won’t cause strain or injury. It also should have a comfortable throttle design that will keep your hand and wrist in a natural position without causing strain. Many great leaf blowers have a cruise control option, which keeps the air at a steady speed and reduces the amount of work you have to do. Weight is another important consideration. A leaf blower might have an excellent and balanced ergonomic design, but if it’s too heavy, then it’s too heavy. Some people are used to carrying around heavy packs and don’t mind the weight. If you’re new to working with a heavy backpack on, though, you should look for lighter models. Backpack leaf blowers usually range between 15 and 30 pounds, but most are between 22 and 25 pounds. Keep in mind that the fuel will add extra weight to the pack. Backpack leaf blower speeds usually range from 150 to 250 miles per hour. Speeds of under 200 miles per hour will be plenty for regular yard cleaning. If you need to clear large piles of wet leaves or heavier debris, you may want to look for a leaf blower that can go above 200 miles per hour. You should also pay attention to volume. Loud leaf blowers can cause hearing damage if you don’t wear ear protection, so you need to know what volume to expect and how to properly protect yourself. You should always wear ear protection no matter how loud the leaf blower is, but if possible, you should try to find one that’s less than 80 decibels. Even if you don’t mind a louder leaf blower, your family members or neighbors might get annoyed with the noise. You may feel overwhelmed by all of the different options when shopping for a backpack leaf blower, but it should be a very rewarding purchase. The Husqvarna 350BT is a good mid-sized option for general lawn care, and the 150BT is ideal for clearing larger or heavier debris. The Makita MM4 is one of the easiest to use and most comfortable leaf blowers, and the PB-770T ECHO is best for tough maneuvering. If you’re on a tighter budget, the Poulan Pro is the best value and has several great features. With a backpack leaf blower, you can save time and energy while keeping your yard clean and clear. If you make a careful choice, follow the manufacturer’s instructions, and take good care of the product, your backpack leaf blower will be a valuable purchase.